Snapchat’s face filters have kept the app going for years by continually attracting new users of all ages. However, many people have been trying to use the AR-powered app on their pets, especially their dogs, but the results haven’t been great. However, the company has now decided to introduce some new ones for pet lovers. Snapchat’s dog filter offers options designed specifically for pets’ faces, such as a butterfly and a pair of reading glasses. Snapchat’s filters were originally designed to only recognize human faces, which has disappointed many users who wanted to use a filter on a picture of their dog or cat, but the new update with Snapchat’s dog filter will enable any dog to look fabulous. You can check the list of currently-available lenses in this video from Snapchat and the Wags & Walks adoption center. Twitter is now being flooded with tweets and comments about Snapchat’s dog filter. Users aren’t hiding their excitement of being able to use the filters on their dogs. There’s finally a Snapchat filter that is for your dog! Before adding butterfly wings or glasses to your dog, you will need to update the Snapchat app to the latest version. The update is available for download from Google Play or Apple’s App Store. After downloading and installing the update, you will be able to see the new lenses available within the app. While moving the camera toward your dog’s face, tap the face, and the app will then display the available lenses at the bottom automatically so you can test how they look like on your dog’s face. Swipe through the carousel at the bottom of the screen to try out other lenses. The rest of the process looks pretty much the same as if you took a selfie. Snapchat’s dog filter enables you to take a picture of your dog with some crazy-looking filters and share the photo via Snapchat Stories. 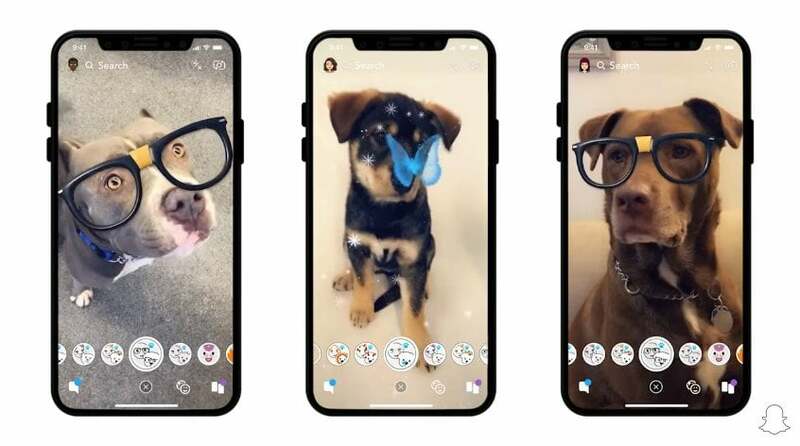 The lenses will also work in the selfie camera so both you and your dog can have matching accessories in photos and videos. While the selection of lenses is pretty limited at the moment, Snapchat will likely rotate them and even add more if they grow in popularity. Based on the number of tweets we’re seeing about the new filters, they appear to be quite popular already.